The drama "Mekura Nagaya Ume-ga-Kagatobi" was premiered in March 1886 at the Chitoseza [casting]. "Mekura Nagaya Ume-ga-Kagatobi" was originally made up of seven acts. The current standard version of this drama is divided into 4 acts, made up of 6 scenes. A group of hot-headed and magnificent Edo firemen are gathered in front the town gate of the district of Hongô. They long to fight against their rivals, the private fire-fighting brigade of the daimyô of Kaga, whose mansion was built in Hongô. The group is led by Matsuzô, the second in command, and all these firemen are impatiently waiting for the return of their boss Umekichi, who went to the rival camp to try to come up with a solution to the troubles. They are worrying about his tardiness in returning and are about to launch a massive attack against the Kaga daimyô's firemen, under the leadership of Matsuzô. Umekichi finally returns and stops his men, urging them to wait while negotiations are carried out with the enemies. However, the men are in no mood to give up the attack. Umekichi, in order to prevent a bloodbath, plants himself squarely before the firemen and tells them that they have to kill him first if they really plan to disobey his orders. Matsuzô suddenly supports Umekichi in his stand. Faced by the determined attitude of of their two leaders, the others firemen are unwillingly forced to disperse. An old man named Tajiemon is going home late at night, passing by the moat at a desert place called Ochanomizu. He suddenly suffers a pain and is unable to go any further. 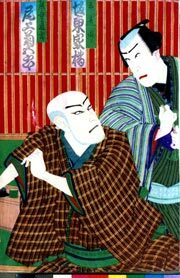 Kumataka Dôgen, a good-for-nothing Edo masseur, comes across the man in pain and stops to offer some aid. However, as he is massaging Tajiemon, trying to find a way to relieve him from his pain, his hand touches a packet of money in the old man's clothes. The temptation to make off with the money is too strong for the evil Dôgen, who stabs the unfortunate Tajiemon to death. Matsuzô, the firemen leader of the first scene, happens to come by and stumbles over Tajiemon's body. He quickly looks around for the culprit and catches a glimpse of the masseur, who is slipping away with a studied air of nonchalance, blowing the traditional whistle, which symbolizes the business of massage. Matsuzô picks up a tobacco pouch which had been dropped at the scene of the crime by the killer. Looking at the departing figure and at the tobacco pouch, Matsuzô easily puts two and two together to come to the conclusion that the masseur and the murderer are the same person. Osetsu, Dôgen's wife, is visited by her orphaned niece Oasa who is in the employ of the pawnshop Iseya. Oasa hands over five ryô to her aunt saying that the owner of the Iseya had given the money to her. Osetsu is worried about Oasa's possession of such a sum, half afraid that she may have stolen it or obtained it by some other questionable means. However Oasa insists that it was given to her by her boss as a simple act of kindness. Dôgen, who had been listening to the conversation, comes out and says that surely there must be more to the story than that and sends his wife off to the Iseya to check into the matter. In the meantime the woman masseur Okane, in fact Dôgen's mistress, comes to the house. 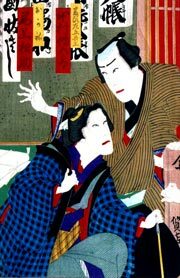 Dôgen discusses the matter of the money from the Iseya with her, and together they force Oasa into a false confession that she had been victimized by the Iseya proprietor in an illicit relationship. Dôgen and Okane hope to use this confession to blackmail the Iseya and get a lot of money. Now Otsume, who is in the slave trade business, comes to the house. Dôgen and Okane had made previous arrangements with her to sell Oasa into prostitution. They hand Oasa over to Otsume. Then they head off together for the Iseya with Oasa's false confession to extort money from the owner. Okane and Dôgen arrive at the pawnshop Iseya on their blackmail venture. Okane slips off and hides to the side while Dôgen approaches the clerks and obsequiously thanks everyone for the kindness they have shown his inexperienced young niece. They all greet him cordially because Oasa is well thought of here. Yohei, the owner himself, comes out to meet him. Dôgen blandly thanks Yohei for the money given to Oasa and says that he had sent his wife Osetsu ahead to find out whether Oasa may not have stolen the money. Yohei reassures him and says that Osetsu had left just a while earlier. But now Dôgen changes his attitude and hints that he does not consider the money to be a gift of kindness. Yohei does not understand until Dôgen takes out the note which he says is Oasa's confession and demands 100 ryô to keep quiet about Yohei's so-called "generosity". Okane presents herself too, as somebody who has witnessed the confession of Oasa. Yohei now realizes that he is victim of a blackmail but he can't find a way to avoid it. Thanks to the intervention of the clerk Sangobê, the matter is settled for half, 50 ryô instead of 100. Dôgen is about to pocket the money and depart when the fireman Matsuzô, who had entered the shop during the proceedings, stops him. He takes the letter in question and through comparison, proves that was written by Dôgen, not by Oasa. Dôgen realizes that his cheap attempted blackmail is about to fail. He tries to challenge Matsuzô to throw him out but the fireman takes out the tobacco pouch that he had picked up in Ochanomizu the night of Tajiemon's murder. He hints that he knows about the Ochanomizu incident, and says that he saw a masseur, no doubt the murderer, scurrying away from the scene of the crime. Dôgen realizes that the situation is getting out of hand and makes his getaway, abjectly accepting a mere 10 ryô together with the tobacco pouch for his trouble. Oasa is no more in the house, and although Osetsu has had nothing to do with her disappearance, Dôgen suspects that she is responsible for Oasa's escape. He binds her up in order to torture her and make her confess everything about Oasa's whereabouts. When Okane comes to the house, he explains the situation to her and says that if Osetsu dies he will marry Okane. Osetsu is saved by the sudden appearance of Kihei, the landlord of Dôgen, who comes to tell his tenant that a dog has dug up a piece of cloth from under the house. Kihei is surprised to find the bound Osetsu and he does not hesitate to free her. The grateful Osetsu says that, without Kihei's help, she would have undoubtedly been killed by Dôgen. Dôgen asks what it is that the dog has dug up. Kihei then shows him the bloodstained kimono which is identical with one that Dôgen had been wearing earlier that year. Dôgen pretends to know nothing about the kimono, but the piece of evidence is overwhelming. Kihei takes Osetsu with him and goes to report to the police. Okane, who had been hiding during the landlord's presence in the house, comes out. She is perturbed by the fact that the landlord has saved Osetsu, but Dôgen has bigger matters to worry about. Making preparations for flight, he confesses to Okane that he had killed Tajiemon, who happened to be Osetsu's brother, at Ochanomizu early that year. 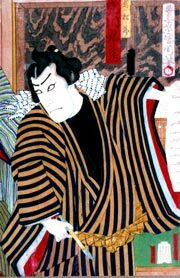 His kimono had been stained with Tajiemon's blood, and as it was one he had worn often, he knew it would be recognized if found. Hence he had buried it under his own house where unfortunately a dog had dug it up. As the pair are about to flee, Kihei arrives with a posse. Okane is captured at the site but Dôgen manages to get away. Dôgen can't run away. He is cornered in front of the imposing Red Gate of the Kaga daimyô mansion. (this gate is now the entrance to the famous Tôkyô University in Hongô). The villain is surrounded by his pursuers and in spite of his wily attempts in a great danmari to escape, he is finally captured by the police.